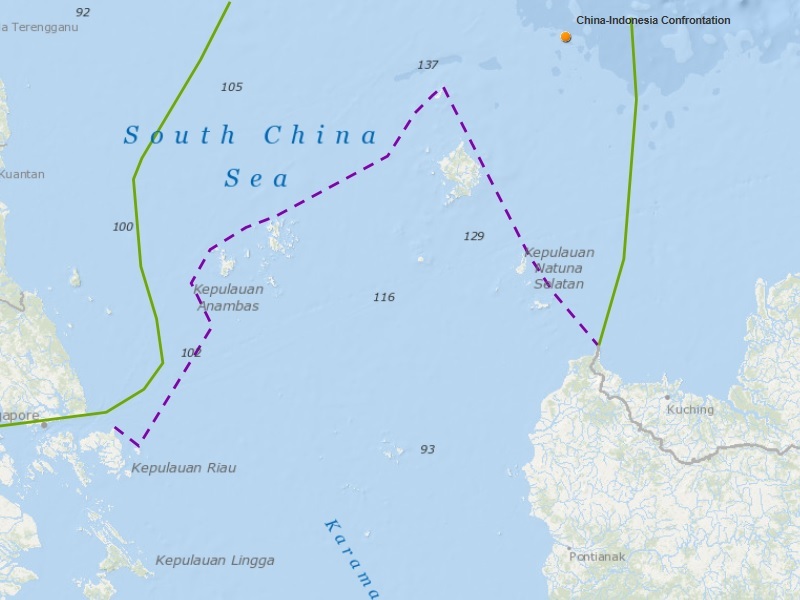 The incursion on March 19–20, 2016, by two armed China Coast Guard ships into Indonesia’s exclusive economic zone (EEZ), 4.34 kilometers off the Natuna Islands, sparked tensions on a new front in the South China Sea. The incident has again raised the question of where Indonesia stands on the disputes—both as a potential party and as a leader within the Association of Southeast Asian Nations (ASEAN). The incident began when a patrol boat from the Indonesian Ministry of Marine Affairs and Fisheries (KKP) seized a 300-metric-ton Chinese fishing boat, the Kway Fey 10078, and arrested its eight crew members for fishing within Indonesia’s EEZ. The crew of Kway Fey were transferred over to the KKP boat while KKP personnel commandeered the Chinese vessel. During the journey back to a KKP facility, a China Coast Guard vessel intercepted the Indonesian vessel and crashed into the Kway Fey, forcing it to stop near the limits of Indonesia’s territorial sea. At almost the same time, a second China Coast Guard vessel also appeared in the vicinity. To avoid further escalation, KKP officers decided to abandon the Kway Fey, upon which China Coast Guard officers took control of the vessel and steered it away from Indonesian waters. As expected, the media produced relentless coverage of this incident. After all, it raised the questions of whether Indonesia is now directly party to the disputes raging in the South China Sea and whether Indonesia will take a harsher stance against China. So far, Jakarta has persisted in claiming an impartial “honest broker” role, which would be untenable if the state came to see itself as an interested party. To date, the Indonesian foreign ministry has consistently described the incident as separate and disconnected from other territorial disputes in the South China Sea, which implies an effort to play down the likelihood of a change in policy. Meanwhile, President Joko Widodo has said that Indonesia is ready to act as an intermediary to calm rising tensions over territorial disputes in the South China Sea and to help accelerate the drafting of a Code of Conduct between China and the ten member states of ASEAN. At this juncture, there are two major policy challenges confronting Jakarta. First, Indonesia maintains that it is not a claimant state in the South China Sea territorial disputes, nor does it have any territorial ambitions in the area whatsoever. Nonetheless, Jakarta does have interests at stake. On the one hand, it has an interest in broader regional peace and stability, including the security of the important sea lines of communication in the region. On the other hand, as an archipelagic state, Indonesia also has an interest in upholding the UN Convention on the Law of the Sea (UNCLOS). Effectively promoting those interests will continue to be a perennial problem for Jakarta. Second, Indonesia maintains continuous advocacy for a more united ASEAN front vis-à-vis China, and the next major challenge for that united front will be a response to the merits decision in the arbitral case at the Permanent Court of Arbitration between the Philippines and China. In 2009, China submitted to the UN secretary general a note verbale in which it officially resurrected the now infamous nine-dash line to delineate its claims in the South China Sea. This line was originally traced in 1914 and later promoted by the Chinese Nationalist government in 1947. Problematically, Beijing’s territorial claims encroach on the EEZ generated by the Natuna Islands, although the claims do not cover any of the island landmasses themselves. Beijing refrained from making its case too vociferously to avoid having to clarify its position vis-à-vis UNCLOS. Until now, Beijing has issued no direct response has come to Indonesia’s 2010 note verbale. Nonetheless, Beijing has at least twice made statements to acknowledge that the Natuna Islands belong to Indonesia. Following the incident on March 19–20, Beijing reiterated this acknowledgement. However, the problem of potentially overlapping maritime zones persists. The Indonesian baseline (in purple) around the Natuna Islands. At top-right is the location of the recent confrontation. Visit the Interactive Map to explore. Previously, a number of statements made by Indonesian officials suggested a coming policy shift. In March 2014, during an event in the Natuna Islands, a member of Indonesia’s defense strategy unit commented that China claimed Natuna waters as its own territorial waters. In April 2014, General Moeldoko, commander in chief of the Indonesian Armed Forces, warned in a Wall Street Journal opinion piece that Indonesia would strengthen its military presence in the Natuna Islands after a new edition of Chinese passports displayed a version of the nine-dash line that encircled parts of the islands. These statements were quickly followed by extensive media coverage and expert analyses that suggested that Indonesia is “no longer neutral” or that it had recognized a territorial dispute with China in the South China Sea. The foreign ministry was quick to clarify Indonesia’s position: Less than one week after the first comment, Indonesian foreign minister Marty Natalegawa made a statement to emphasize that there is no dispute between China and Indonesia over the Natuna Islands. He said that although Indonesia indeed sent a note verbale regarding China’s nine-dash line to the United Nations, this move does not suggest the existence of a territorial dispute. In 2015, during a visit to Tokyo, President Widodo publicly reiterated Indonesia’s rejection of China’s nine-dash line claim. In November, the coordinating minister of political, legal, and security affairs, Luhut Binsar Pandjaitan, made the rather shocking statement that Indonesia could follow the Philippines’ lead and take China to court over the South China Sea. Both statements drew heated responses from Beijing, and were followed by clarifications from different offices in Jakarta. The question from outside observers remains unchanged since the initial exchange of notes verbale: Will a time come when Indonesia actually takes a stronger stance against China and turns off-the-cuff remarks into official policy? From Indonesia’s perspective, however, the more pressing question is how to maintain its role within ASEAN as the organization struggles to form a united front in response to China’s pressure in the South China Sea. Indonesia has long been a vocal proponent of a legally binding code of conduct in the South China Sea and has sponsored a series of dedicated workshops on the issue. 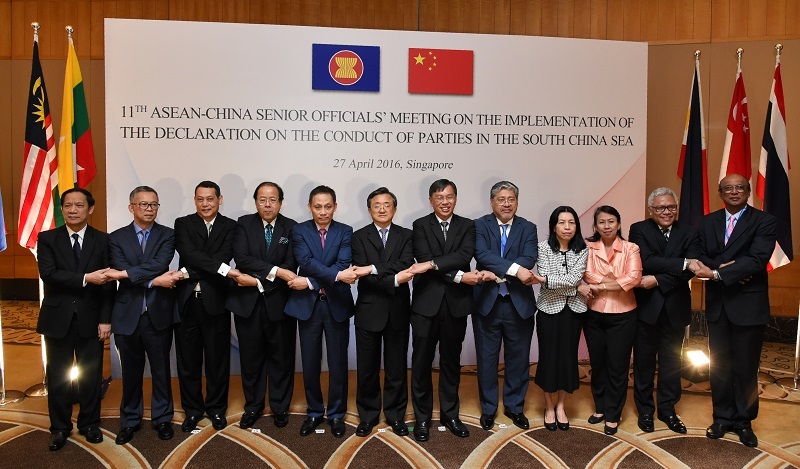 It has continuously and consistently pushed for ASEAN unity and centrality in handling this issue. Now, in 2016, Indonesia continues to push for a solution through ASEAN. This will likely continue to be the central pillar of Indonesia’s regional strategy. On the horizon, however, is an impending crisis for ASEAN unity. In October 2015, the arbiters in the case brought by the Philippines against China decided that they had jurisdiction over certain aspects of the dispute and could hear the merits of the case. The decision on jurisdiction was generally considered as giving the advantage to the Philippines, as China had expected that the court would not continue at all. The world is now eagerly awaiting the final ruling on merits while weighing responses to the very strong possibility that Beijing will simply ignore the result. We can expect a statement from ASEAN. Yet getting ASEAN to speak with one voice continues to be a stumbling block, and therefore the degree of severity of the statement remains up in the air. While the Philippines and Vietnam are on the offensive against China through the arbitration process and capitalizing on domestic indignation over the oil rig incidents, respectively, Cambodia, Laos, and Brunei are on much friendlier terms with China. On April 24, following a meeting in Vientiane, China’s foreign ministry announced that China had reached “an important consensus” with the three states, which includes an agreement that the South China Sea territorial dispute should not affect relations between China and ASEAN. Individual countries’ reactions to the court ruling will also be important to observe. Indonesia’s current official stance toward the arbitration proceedings is that it is “observing” them, and Jakarta has not officially indicated any preference in the result. We can expect an official statement once the court ruling is out and it will be particularly interesting to observe whether the recent fishing boat incident in March influences the statement. If China blatantly disregards the ruling, it may in turn add to the arguments for a change in Indonesia’s position. That position will also likely indicate how Indonesia’s strategy for upholding ASEAN unity will unfold. Beyond a response to the arbitral award, there are larger debates within the Indonesian foreign policy community on whether it is high time that Indonesia push for a settlement of the territorial and maritime disputes. In arguing for such a push, proponents note a number of options. First, continuing with the ASEAN way that Indonesia has favored historically, Indonesia could promote a more ambitious agenda for ASEAN-China dialogues. Second, setting aside the rigid procedures of that format, Indonesia, as the only country that can, could take the lead in advancing talks on the code of conduct. Third, it could seek to work together with Singapore—another non-claimant state—to facilitate and advance the code of conduct negotiations. Regardless of the precise format Indonesia eventually decides on, the common thread will be an emphasis on working with ASEAN partners. If there is now some uncertainty about the future of Indonesia’s approach to the South China Sea dispute, at minimum this aspect of Jakarta’s regional strategy will likely remain unchanged. Shafiah F. Muhibat is a senior researcher at the Centre for Strategic and International Studies (CSIS) Indonesia, and Chief Editor of The Indonesian Quarterly. Banner image source: © Michael Eko/Getty Images. Boats parked at a fishing port in Pontianak, Kalimantan, Indonesia. Pontianak is located 420 kilometers south of the Natuna Islands on the island of Borneo.